Remember last week when I referred to asparagus as a super food? When I alluded to its super-sized selection of vitamins and nutrients, I had no idea that it also could be super in size as well. Courtesy of Margerum's Herbs, Etc., this monster of magnesium (asparagus contains 4% of your daily allowance) will probably become part of a cream of asparagus soup I want to make either today or tomorrow. Incidentally, if anybody out in Feed Land has a recipe for said soup, lay it on me either here or on Facebook. I could just look one up on the interweb but it would be more fun this way I think. Wow! 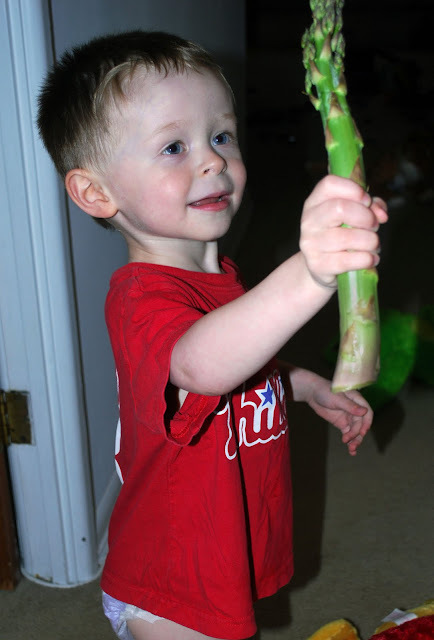 That asparagus is super-sized. I don't have a recipe for cream of asparagus soup, but now I am craving some!